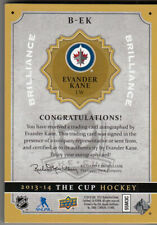 #B-EK Evander Kane (WIN) BRILLIANCE AUTOGRAPH INSERT CARD. 2013/14 UPPER DECK THE CUP HOCKEY. Sharp HARD SIGNED Blue Ink Autograph! AMAZING AUTOGRAPH CARD! A Really Great Looking Autograph Card! 2010-11 Upper Deck Victory ATLANTA THRASHERS Hockey Team Set. Contains all base and rookie cards (1-250) for the team listed. Cards average Nr/Mint - Mint condition - Included players listed below. 2010-11 Upper Deck Victory ATLANTA THRASHERS Hockey Team Set. Contains all base cards (1-200) for the team listed. Cards average Nr/Mint - Mint condition - Included players listed below (03)-008 Evander Kane. Evander Kane. Black Parallel Card #301. 2009-10 Upper Deck Victory NHL Hockey. Province -----------------------------------------Rate . Canadian Residents must Add GST or HST on final cost . First Card.